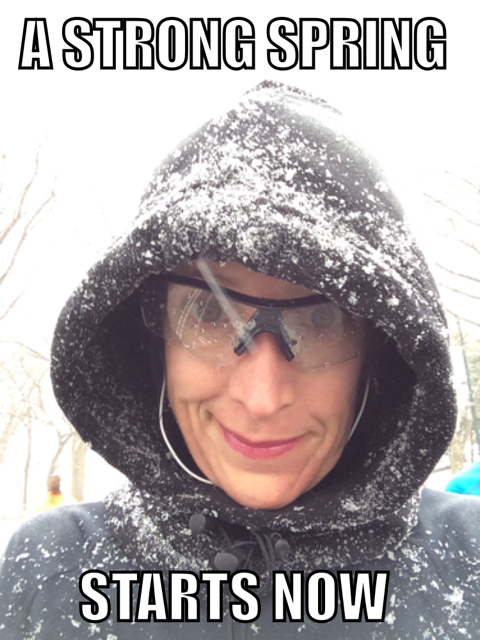 In case you need them: Tips for running in really cold winter weather! ← 99.9% of the times it is not “I can’t”; just learn to say “I don’t want to”. I love winter running. It reminds me of living at home in near Buffalo, NY and training for wrestling. The crunch of the snow, the smell of fireplaces, the warmth of my breath in the air. It always seemed such a magical time. Now, my ankle is jacked up, i haven’t run in almost 3 weeks and I have a May MARATHON!!!!!!!!!!!!!!!!!!!!! The pool will have to do for now. Maybe my bike if the Kentucky weather ever got back to normal. What the hell is 9* and 3 inches of snow doing down here?